Serve this as a first course and plate 3-5 carrots per person. Skip the yogurt for a vegan-friendly version. Cook carrots in a large pot of boiling salted water until crisp-tender and skins easily rub off, about 5 minutes; drain. Transfer to a bowl of ice water. Using paper towels, gently rub carrots to remove skins and pat dry. Mix sugar, mustard powder, paprika, cumin, and coriander in a small bowl. Toss carrots with 1 Tbsp. oil in a medium bowl. Add spice mixture; season with salt and pepper and toss to coat. Heat remaining 3 Tbsp. oil in a large skillet, preferably cast iron. Working in 2 batches, cook carrots, turning occasionally, until deep brown all over, 6–8 minutes; season with salt and pepper. Meanwhile, place yogurt in a small bowl; season with salt and pepper. Add harissa paste, 2 tsp. thyme, and ½ tsp. lemon zest and gently swirl ingredients, stopping before yogurt turns pink. 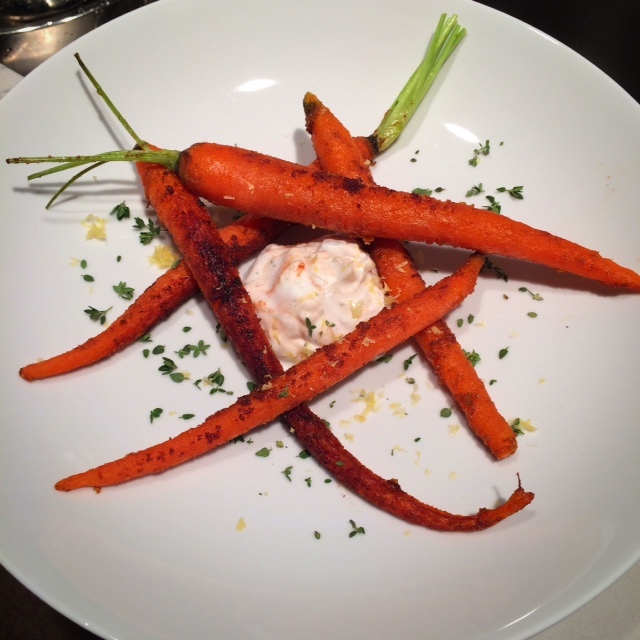 Spoon harissa yogurt onto plates and top with carrots, more thyme, and more lemon zest. Serve with lemon wedges. DO AHEAD: Carrots can be cooked in boiling water and peeled 6 hours ahead. Cover and chill. Spice blend and yogurt (minus the harissa) can also be mixed ahead of time. Just before plating, mix in harissa.